Created on Oct. 25, 2011, 8:02 p.m. RAGE. What a weird one. The main feeling being the development team must have been sitting in a bubble for the last five years. It is missing many of the features of modern shooters, and in many instances that isn't something to complain about. Similarly the engine is like nothing that has been done before or will probably be done again. Almost all the engine developments that have happened in the last few years seems to have passed them by. Impressive as it is, the engine isn't just about the Megatexture technology - and the Megatexture technology isn't just about what gets displayed on the screen at the end of the day. RAGE took a fundamentally different approach to constructing a virtual world. Unless the Megatexture stuff went over your head, or passed you by, this is the basic idea. Every texel in the RAGE world is unique. There are no tiled textures or repeated objects. 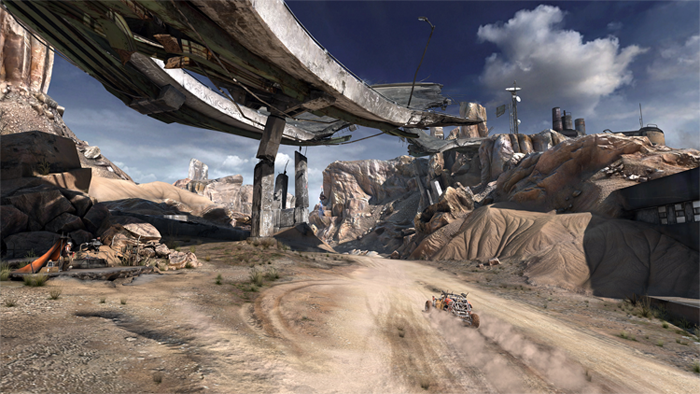 Each unique meter of texture across the whole landscape is stored somewhere in memory. This texture data is then loaded and unloaded dynamically depending on how close the viewer is to it and what they are looking at. What this means is that the artists have essentially total control of every millimetre of the environment. Something almost unheard of before. For development id employed a host of "stampers" who's job it was to place small objects and also add "stamps" to the scene - by which I mean decals, dirt, rubbish, cracks and grunge - stamped directly onto the world. RAGE's environments are by far the richest I've ever seen. I can't say what impact this process will have on future developments. What will be adopted, and how it changes the roles of artists. The whole process is so orthogonal to what is current it is almost impossible to evaluate. What is clear though is the fact that the world id created is amazing. 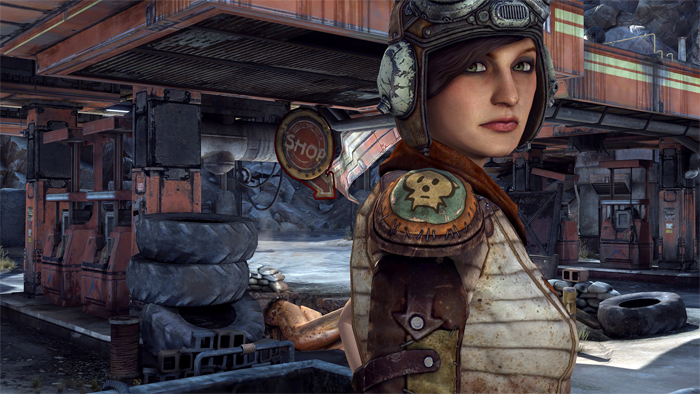 As well as the environments the character animations are some of the best we've ever seen. NPCs seem to react appropriately according to what they are saying and enemies will run, hobble and stumble in a vast number of ways depending on where they are shot. The music is fantastic and sound satisfying. So you'd think RAGE is shaping up to be one of the most involving and atmospheric games out today. Sadly it isn't. The environments may be rich but due to the nature of Megatexture they are static. 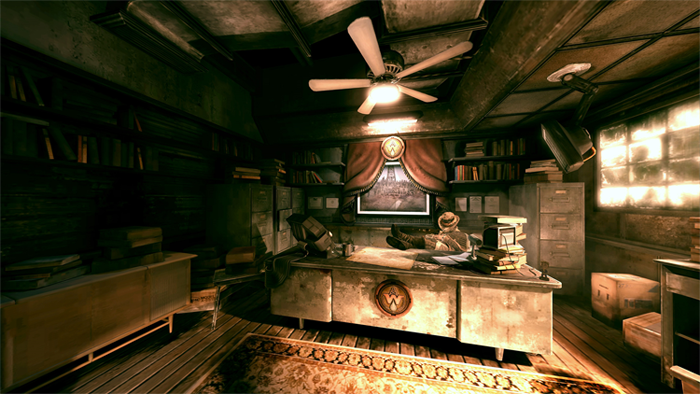 Lighting is baked into the scenes and almost no objects can be interacted with. The world is plagued with invisible walls and there are not even the basic physics objects we have come to expect so readily. It feels weird walking up to a crate and not being able to push it. Outside the skybox is a still image. Time of day and lighting cannot change. Plants don't sway in the wind and terrain is not destructible. Finally there is my pet peeve - the tireless color correction - throwing everything into sickly shades of blue or green. Painterly is an appropriate description for RAGE - if only in describing how static it feels. It is a beautiful game but it does not feel right at all. I hate knowing that the box in the corner can never be moved, knowing that the time of day will never change, that those shadows will never drift across the ground as it reaches evening. I hate knowing that the book on the self could never be taken down, not within any context of the story, knowing that the lights will never flicker out. It feels like the whole world is made out of painted cardboard and your character is a miniature figure - the toy of some kid. A friend told me once "Carmack is sick". I'm starting to believe him. You play an id game and there is only one God. Carmack. When I play games I don't want that competition. Half Life may be old, but at least I can pick up that can; or turn on my torch and let there be light. Screenshots thanks to Dead End Thrills - well worth a read.